In homage to two great icons: Jesus and John Cusack’s immortal pose in Say Anything. If I was a chick and Jesus was doing this outside my window with the halo and the boom box playin’ our song, I think I’d pretty much be smitten. Actually, I’m a guy and that would be enough to sway me to invite him into my heart forever. Bonus points for the coat and shoes detail. You love this tshirt. This tee loves you. 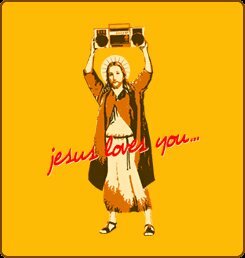 So, get the Jesus loves you t shirt now. While you’re getting all religious check out the top funny Jesus T Shirts you will ever see for sale in your lifetime. Yes! Finally someone writes about search engune optimisation.